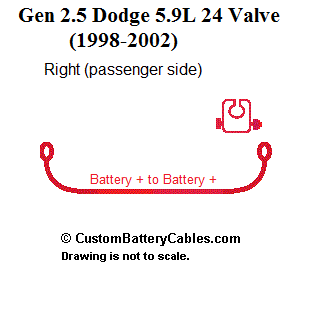 2/0 Right Positive Cable for Gen 2 Dodge with 5.9L, 24-valve, Cummins diesel and dual batteries. 60″ length 2/0 Battery to battery (aka crossover cable). One (1) Positive (+) military style battery terminals with a lock nut. Loom and cover are optional and available for purchase below.